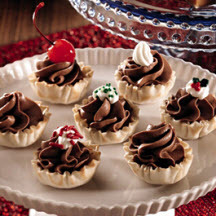 These adorable mini tartlets, filled with a creamy chocolate mascarpone filling, are simply irresistible. Whipped whipping cream, decorative sprinkles or maraschino cherries for garnish. Melt chocolate chips; cool slightly. Mix with cheese at medium speed of electric mixer for 2 minutes. Pipe mixture into chocolate cups; top with garnish; chill.